If you're not superstitious about black cats, you can enjoy the mystery of them! This particular cat has nestled himself among some whimsical flowers, adding to his mysterious demeanor. Want to achieve the big and bold stitches you see here? Use Sublime Stitching's bold tip transfer pens and ​Anchor Soft Cotton thread. Cat people know how true this pattern is. All you really need is love and a cat. For this free pattern, most of the embroidery forms the words, then a bit of stitching and felt appliqué creates the cute kitty! Punch needle embroidery is a different process than traditional hand embroidery, but the results are just as amazing. In fact, you can use it to create unique textures like the filling on this chair and the soft loops of the rug. Even if you don't do punch needle, you can still embroider this cozy cat pattern with your favorite stitches. Cozy Corner Embroidery Pattern, $9, Suter Design Co.
Cat owners know that every cat expects and deserves to be treated like royalty. Honor your furry monarch with this gorgeous pattern that's filled with fun textures. The style looks great in a semi-monochrome color palette, but you could also customize it to match your cat. Have you ever walked past someone's home and spotted a cat in the window? How about six cats? This free pattern features some fun and frisky felines hiding, stretching, snoozing, and hanging around. Cats often love messing with plants and flowers, but this kitty seems to have floral designs worked right into her shiny black coat. Stitch this as a framed piece of art, or add it to a T-shirt to show your love of cats! As expected, this kitty doesn't look too happy about wearing a sweater, but it's still so cute! Although Cat of Bee's Knees Industries designed this as a holiday pattern, you could embroider the sweater in other colors to make this suitable for any time. Plus, look for more cute kitty patterns in her shop! With simple straight stitches, you can make this adorable cat who's out for a midnight stroll. This charted pattern uses cross stitch technique to show you where to count and stitch all the lines, and the eyes and ears have a cross stitch filling. The result? A fat cat with a unique mix of stitching. This fluffy cat found a spot among the houseplants and looks ready to cause some mischief. But she's so cute that you probably wouldn't be mad for long. Intermediate embroiderers should have no trouble stitching this pattern, and new stitchers can learn a few stitches to jump in. 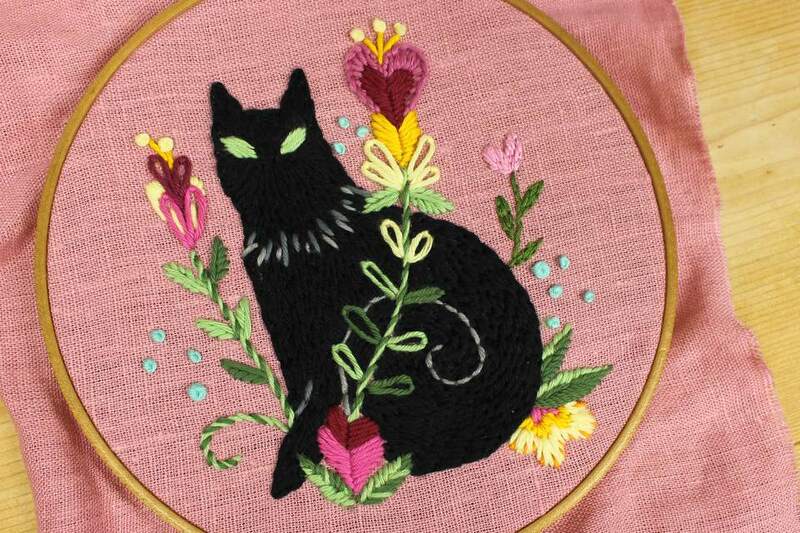 This isn't exactly a cat embroidery pattern, but it is a cat and there is embroidery. Wendi Gratz shows you how to combine her Cats Quilt appliqué pattern and Continuous Stitching floral pattern to fill an 18-inch hoop. The finished project makes you say "meow! ", er, "wow!" Do you love your cat? Then show the world as you stitch this free pattern from Crafters Boutique Handmade. 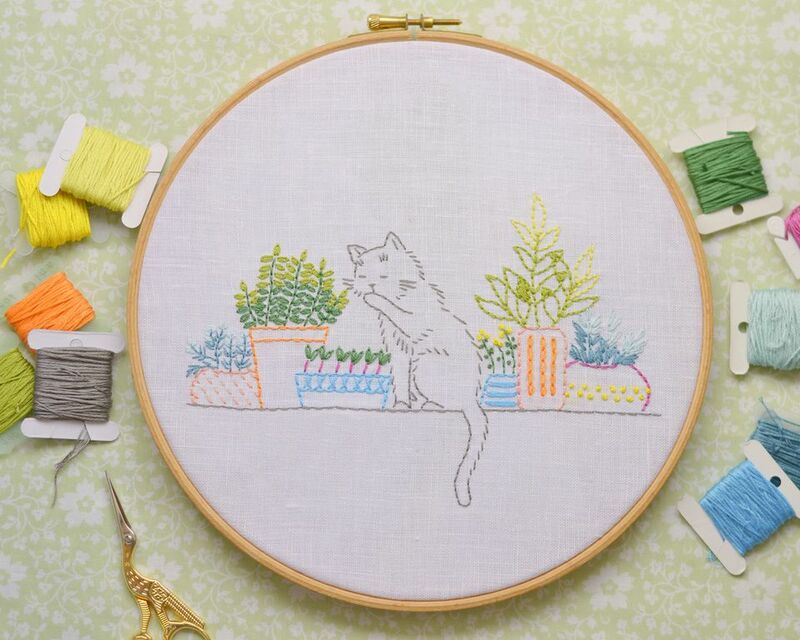 The kitty is so cute, and you'll love stitching the flowers too! Work the outlines in a simple back stitch or go all out with fill stitching and other fancy stitches. A cat who loves yarn may be cliché, but that's because most cats really do love playing with yarn. This advanced embroidery design uses a variation of satin stitch to make balls of wool that look like the real deal, and even more stitches to create fun textures. Want to jump right to stitching? Pick this up as a kit in O1OU's shop. Rebecca from Hugs are Fun guest posts at Bugs and Stitches with her kitty appliqué pattern. But she also made it into a hand embroidery pattern, and both versions are free. Why not stitch a few of them? This is a cat filled with cats! After stitching all those little kitty faces, you can sew this cat-shaped stand-up plush. The weighted bottom keeps it upright so your own furry friend can have a pal to hang out with. For a modern take on a cat's fur coat, pick up this kit from Hawthorn Handmade. The geometric designs give this sleepy kitty a style of its own and the preprinted fabric make this an easy way to get started in embroidery.